The pros and cons of new wearable devices to detect allergens in food and in the air. Are There Nuts in That Brownie? New wearable devices aim to detect allergens in food and in the air. But should you trust them? At our annual family reunion one summer, my cousin Shara was happily stuffing herself full of chips and dip when her older brother noticed her face turning pink. Her eyelids and lips inflated like tiny balloons. Then she began to gag, cough, and gasp for air. We screamed for help, and her panicked parents whisked her away to a local hospital. Shara knew she was allergic to shellfish but didn’t suspect anything on the picnic table contained it. That delectable dip? It was made with crab. My cousin nearly died—not from negligence or ignorance, but simply from unexpected exposure. And she’s not alone. In the U.S., food allergies cause about 200,000 emergency room visits each year, according to the Asthma and Allergy Foundation of America. One study estimates that one in five food-allergy hospitalizations is due to accidental exposure to “hidden” allergens. But what if there were a way for an allergy patient to test food quickly and easily, a portable technology sensitive enough to detect trace amounts of offending allergens in our food or air? It’s an ambitious goal, but that’s exactly what a host of new companies are trying to develop. Take Allergy Amulet, the company that will soon begin beta-testing a chic line of wearables—necklaces, watches, and cellphone cases—that cleverly conceal chemical-based allergen detection strips. Users simply dip one of the disposable strips from their accessory into the food in question, and insert it into a smartphone-mounted sensor that will sound an alarm if it picks up on the presence of the particular protein. Abigail Barnes, the company’s founder, said she hopes the device will decrease the number of severe reactions due to accidental exposure and help to alleviate the anxiety of people with allergies. The first round of devices will only be set up to test for peanuts, but the company plans to make strips for a variety of other common food triggers such as tree nuts, dairy, shellfish, and gluten. The development of devices like these comes at a critical time. 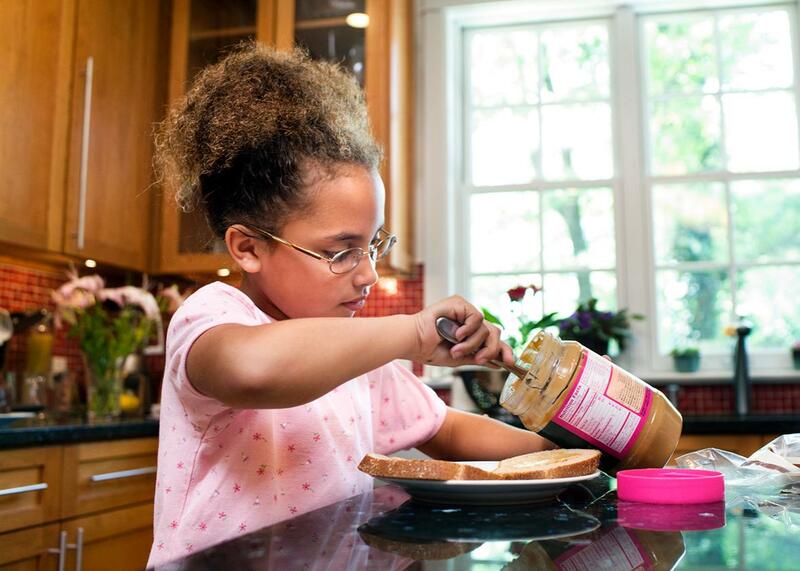 The Centers for Disease Control and Prevention estimates that 4 out of every 100 children has a food-related allergy. * The incidence of food allergies in children—and hospitalizations related to those allergies—increased from 3.4 percent to 5.1 percent in just over a decade. It’s not just food allergies that are on the rise either: In 2014, 7.4 percent of American adults and 8.6 percent of children had asthma, and hay fever occurred at even higher rates. It’s not surprising, then, to see a whole bevy of wearables related to allergies and asthma in development. In addition to Allergy Amulet, there’s TZOA (prounounced “zoa”), which aims to let users track concentrations of airborne allergens, pollutants, and other environmental measures in their immediate surroundings and through a crowdsourced map. Health Care Originals has ADAMM, a device that attaches to the chests of asthma patients, monitors vitals such as respiration, heart rate, and cough counts, and alerts the user if signs point to an imminent attack. Project ABBIE, a partnership between Harvard’s Wyss Institute and the KeepSmilin4Abbie Foundation, is an ambitious attempt to design a wearable that would be able to detect the earliest physiological and biochemical signals of an anaphylactic response—whether from food allergens, adverse drug reactions, or even insect stings (which kill as many as 90-100 people a year)—and preemptively inject epinephrine, like an automatic EpiPen. These devices represent a major new direction for wearable health-related technology. By now, we’re already accustomed to fitness devices like Fitbit, which collect data such as heart rate or steps taken, so we can evaluate ourselves, set goals for our fitness level, and track progress over time. But these allergy wearables aren’t for long-term monitoring: They’re a digital first line of defense designed to moderate, or entirely prevent, acute events in real time. Should it work, this type of preventative technology would change everything for people with allergies, transforming the outside world from an anxiety-producing hazard zone, filled with potentially painful and even deadly invisible particles, to a literally safe(r) space. For people with severe allergies, such as my cousin, this is huge. But it’s important to remember that these technological advances also raise major flags. First, as with many other kinds of personal electronic devices, come the privacy concerns. Wearables that collect and share data, like ADAMM and TZOA, have the same potential pitfalls as other health-related apps and devices. All of the information collected from users about their basic health, symptoms, and allergic conditions are vulnerable. As places like Tech Republic have reported, all that data from wearables can be sold or hacked if it isn’t adequately secured and protected. And while info about your allergies seems harmless (and, let’s face it, probably isn’t going to be used to blackmail you), a hiring manager might still be tempted to consider your allergic history as a health risk, weighing your potential for lost productivity and work absences. Maybe I’m being slightly paranoid here—but maybe not. It also remains unclear what parts of the data being collected by wearables are covered under the Health Insurance Portability and Accountability Act. And it can be tricky to find out who owns the data being collected by the devices, and whether that information can be used or sold by the company for research or other purposes. Patients who want to use them should first attempt to determine whether the devices adequately protect and secure their data. But most importantly, we’re talking about individuals with medical conditions for whom this monitoring is literally life-and-death. Accurately measuring allergens in the environment is tricky, prone to scientific limitations and human error (though it’s getting better). For wearables intended to detect allergens, the real danger lies in the problem of false negatives: A trace amount can cause an immediate, deadly anaphylactic response for some, which means the tech has to perform flawlessly each and every time. If someone like my cousin uses a device that isn’t sensitive enough—or if a probe isn’t dipped into the exact portion of food that contains the hidden allergen—it could cause a major, life-threatening reaction. And those consequences don’t stop with the patient. Restaurants, fast-food chains, and food processers have already seen lawsuits over undisclosed allergens, so it’s not difficult to see liability issues raised around other types of allergen detection and disclosure issues, too. The personal and legal ramifications of a malfunctioning device could be devastating for individuals, their families, and companies alike. In other words, these wearables are tools that, assuming they make it to market, should be used in tandem with other measures—like when you don’t totally trust the waiter who swears he double-checked to make sure your brownie sundae doesn’t contain peanuts. They cannot replace the basic vigilance people with allergies or asthma have always had to use offline. Getting individuals and those they interact with to recognize the inherent limitations and privacy concerns of these devices will be difficult. Too often, technology is seen as infallible. (Just look at the tragic example of the driver who died in May while testing the limits of his Tesla’s autopilot feature.) The companies that design these wearables will need to be more emphatic than other tech manufacturers about the shortcomings—in terms of accuracy and security—of their products. So for the near future, it’s best to keep asking what’s in the dip at the family reunion.